In a few days, I’ll have lots of Scotland photos and a long post. Sorting and prepping the photos is going to take some time. Plus, Ken took lots of photos as well, and I will include some of Ken’s photos in a future post. For now, I’ll try to put up a photo each day. 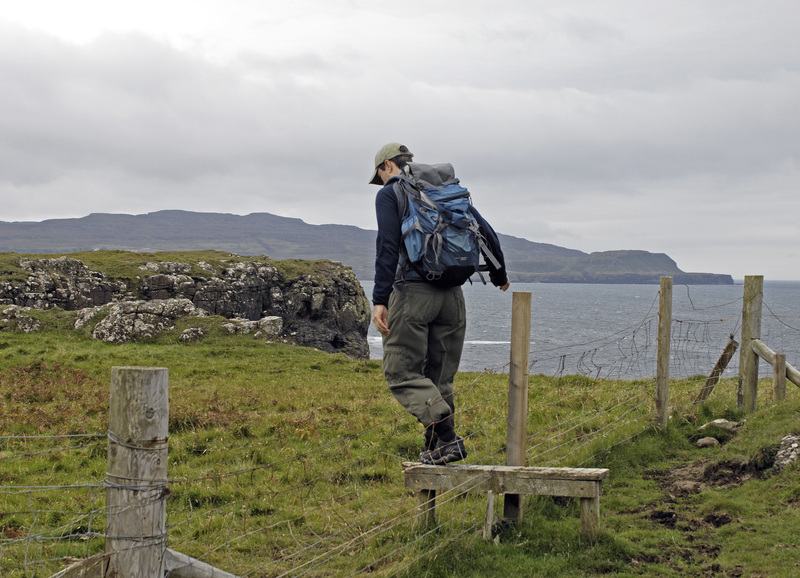 Above, Ken, my indefatigable hiking companion, crosses a stile near Calgary on the isle of Mull. We saw lots of stiles — from very simple ones to complex works of functional art — and photographed them all. This was written by daltoni. Posted on Thursday, September 13, 2018, at 7:12 am. Filed under Photography. Bookmark the permalink. Follow comments here with the RSS feed. Trackbacks are closed, but you can post a comment. Looking forward to posts and photos. Am sure it as a wonderful trip.